A couple of weeks ago we went to Chaska Grill, a Middle Eastern Restaurants, specializing in Indian and Pakistani Cuisine. The food was extraordinary. Their Goat Biriyani was the best I had in US till date and the Kabas.... oh!!!!!! You need to really taste it. We had ordered Seekh Kabab and Malai Kabab. Thought I am very very fond of Kababs, I must admit, Seekh Kabab is not one of my very favorite. Not many Indian Restaurants can make them perfectly. Often they are overloaded with spices and are dry. The best Seekh Kabab I ever had was at my friend's wedding at Lucknow. They was absolute melt-in-mouth. The juiciest and most flavorful one I ever tasted. The one that we had in Chaska Grill, came pretty close. It was not overtly spiced and had coriander seeds coarsely pounded in the mixture. Every time you get a seed in the mouth, there is a flavor explosion in your mouth. Since then, I was itching to find a perfect recipe to recreate that Seekh Kabab magic in my kitchen. But it was not very easy. Nearly all the recipes, I found in the World Wide Web, used fine powders and not coarse powder. Eventually, I started looking for Pakistani recipes and found a close match at this site. This recipe does not use any ginger or garlic. Making a meat dish, with our ginger-garlic is unimaginable for me. So I tweaked the recipe a little and came up with my version. Another great tip that I learnt from VahChef Sanjay Thumma, is that "Moisture is a great enemy of good kababs". So I make sure my meat and all the ingredients I use are absolutely dry. I do not use ginger-garlic paste, since it has water content. I mince my ginger and garlic very finely with my knife. My Seekh Kababs turned out very good and went extremely well with my unusual dip, I served it with. Dry roast the Coriander seeds and Anardana seeds, till lightly fragrant. 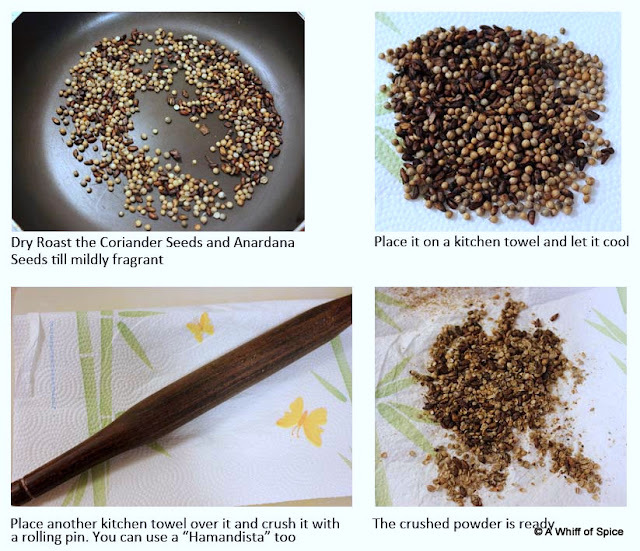 Use a Hamandista (mortar and pestle) or a rolling pin to make a coarse powder. Do not use a dry grinder/ coffee grinder to make a fine powder. Place the ground meat in a large bowl and pat dry with a paper towel. Add all the masala and mix very well. If using lamb or beef, cover mixture and refrigerate for 3-4 hrs. For chicken or turkey, 30 mins is more than enough. Preheat the oven at 450F. You can shape the kababs as per your desire. You can make them round, like meatballs or flatten them like a 'tikki' or burger slider. Or you can shape them to look like actual Seekh -wala seekh kabab. This technique was told by VahChef Sanjay Thumma during his Seekh Kabab episode. Take a wooden spoon and lightly grease it. Take a fistful of meat-mix and wrap it around the handle of the spoon, like you would do in a seekh or skewer. Then gently push the meat-mix from bellow and pull away from the spoon and then layer it on a baking sheet, wrapped in aluminium foil and lightly greased. Please have a look at the video to check the exact technique. Bake the kababs for around 20 mins, till juices run clear. Keep checking the kababs after 15 min, because over cooked kababs are dry and tough. We want soft, moist, juicy and succulent kababs. I made an unusual dip to be served with the kababs. - Tahini Yogurt Dip. Traditionally, Coriander-Mint or Mint-Yogurt chutney is served served with kababs. Since both tahini and kababs are part Middle-Eastern cuisine, I thought it would be a nice change. I got the recipe from the label of the tahini bottle. The original recipe calls for 1 cup of Tahini and 2 tablespoon of Yogurt. I reversed the ratio and added 1 table spoon of tahini to half a cup of fat-free Greek Yogurt. I also added a little honey to add some depth. The dip was surprisingly refreshing and went really well with the Seekh Kababs. In a glass bowl mix all the ingredients very well. There should be no lumps. The dip should be thick and creamy and smooth. Tip: Use only Greek Yogurt. If using regular yogurt, hung it for couple of hours, till all the water is drained off. We want a creamy dip and not raita! If you do not have honey, just skip it. Please do not add sugar instead. Honey is used to add depth to the layers of flavors and not used as a sweetener! Diabetic Platter: The Seekh kababs are virtually cooked without oil. They are purely cooked in their own fat. I had used lean chicken and hence the fat content is even less. I had paired it with whole wheat rotis, green salad and the Tahini- yogurt dip to have a wholesome meal, packed with protein, fiber, complex carbs and essential fatty acids. Tried it today.... turned out great!! Thanks!! Hey, I tried two recipes today one is seekh kebab that you mentioned and second one is kakori kebab recipe that I read at Positive News Trends. Both were delectable and i will keep in touch for more recipe. Thank you so much guys.